Here's what my steak soup looked look. The soup was definitely weird but at least it meant the steak wasn't dry. Served with the world's saddest "salad" (one piece of Bibb lettuce with radish strips and 3 grapes). Nevertheless, I would order this again, and I never order AA steaks. Beef was fine, mash was probably the best part of the meal, broccolini was awful and tasted like water, as if it was frozen, heated and then reheated. 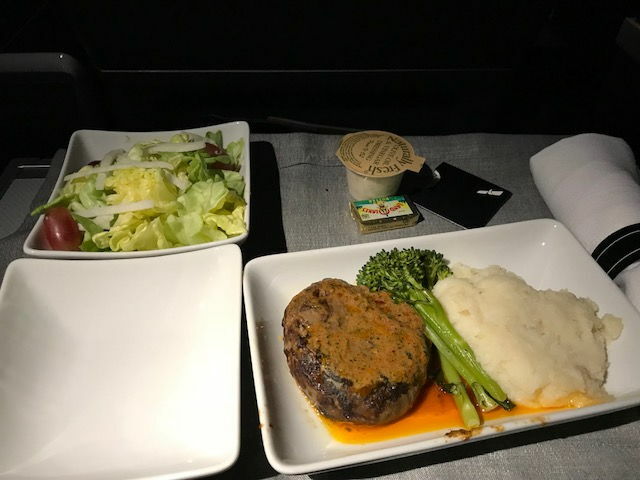 flightrisk what route was your Beef Filet served on? Yours looks delicious while safari ari's looks dismal. I was thinking of ordering this on an upcoming CLT flight but having second thoughts. The problem with things like fillet is that it has so much less to do with how the catering prepared the food as how it was warmed up on board. and even there it has much to do with how long until the FAs can start working,how long they spend taxiing, etc. That's one reason why I hate the idea that they rush out meals so quickly. It was AA 2539 PIT-DFW on a B738. Interesting, SFO777 had flown on the same route in the past and had a wonderful steak, I wonder what is up with that route that gets the steak perfect. Taxi time?Do they start the steaks ion the ovens while they are still on the ground? CLT you are going to be taxiing around a lot, thus the steaks sit int eh over longer. While in PIT you pretty much take right off. Pretty sure that PIT is double catered from DFW which makes it even more impressive if they consistently pull it off. OOps, my question in NEWBIE section should have been posted/asked here. Except our taxi time was one of the quickest I've ever had at CLT, less than 10 minutes, and the meal was heated once airborne. God I hope it's not the same burger, wouldn't the bun be stale by now? I had the burger MIA-LGA today. Maybe it was the massive hangover, but I thought it was great. The condiments they served with it were excellent. USFlyerUS and AANYC1981 like this. Was pleasantly surprised with the Korean Beef Entree on this flight. AA got the beef right, the potatoes weren't rock hard, and the Japanese Shrimp was excellent. I mostly lurk here just to see what options might be. Wouldn't you know I would get 2 choices I haven't seen talked about much. Of course there is also the cheese plate and various special meals. Tex Mex salad was okay. Chicken tasted smoked although did have grill marks, and rub was very salty. Appetizer was two shrimp with old bay seasoning on a bed of pineapple salsa. I have my family booked to go home on AA KOA-DFW. 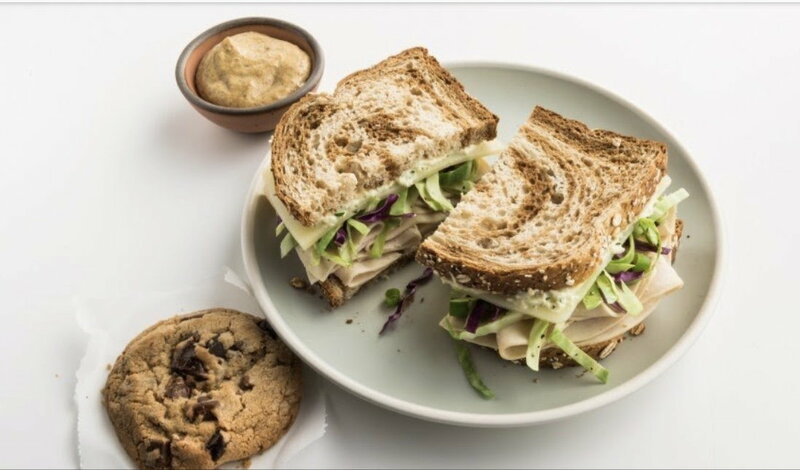 AA states that this flight provides a coach meal - does anyone know what the offering is? My guess is nothing worth eating so I may have to prepare a meal for the four of them to take on the flight. Flight leaves Kona around dinner hour. 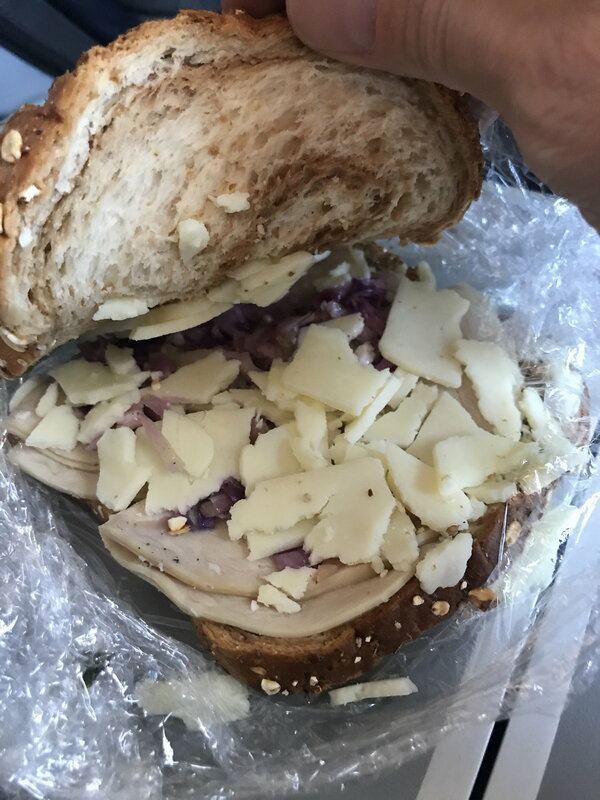 I’m glad that American’s caterer scraped all of the dregs of cheese out of the deli case and carefully placed each shred on my “new and improved” sandwich. Or perhaps that’s a generous assessment of what happened. Anyway, here’s to quality control. Am doing PHX-HNL next week & this was one of the choices-wondered if anyone had seen it yet? No PDB at all due to 'late catering'......flight went out over half empty after non-revs were given seats.